Investors bought the single currency on Monday and it was trading 0.25% stronger in the morning, with the EURUSD pair seen changing hands at 1.1650 at the last check. The euro zone’s inflation failed to spur any significant volatility as it met analysts’ expectations. The year-on-year CPI stayed at 2.0%, while the core gauge also did not move and remained at 1.0%, well below the ECB inflation target of 2.0%. However, the trend remains positive and the central bank expects core inflation to move gradually higher in the next year, which might support the euro on the currency markets. The US calendar will offer only the New York Empire State manufacturing index for the month of September, which is expected to decelerate slightly to 23.0 from 25.6 scored in August. Bulls managed to defend the bullish trend line for now and the euro is pushing higher, but is now testing the first major selling zone around 1.1655. If the euro jumps above, further appreciation toward the 1.17 level could happen. 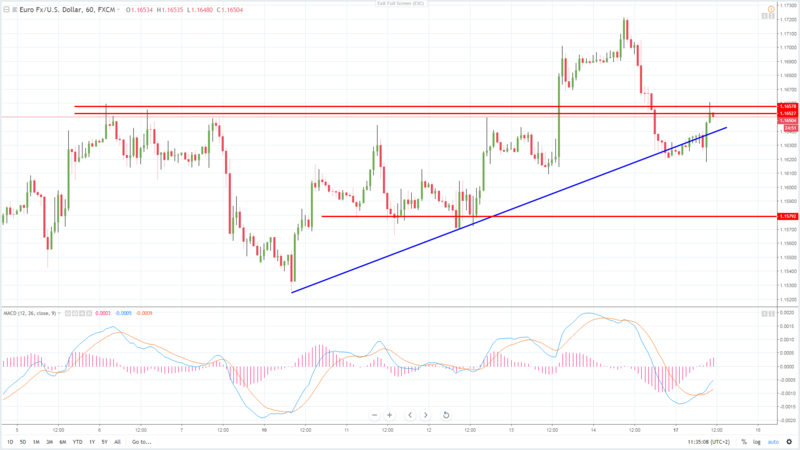 On the downside, if the trend line fails to support the pair, bears could push the EURUSD pair back to 1.1620 or possibly 1.1580 in the near term.